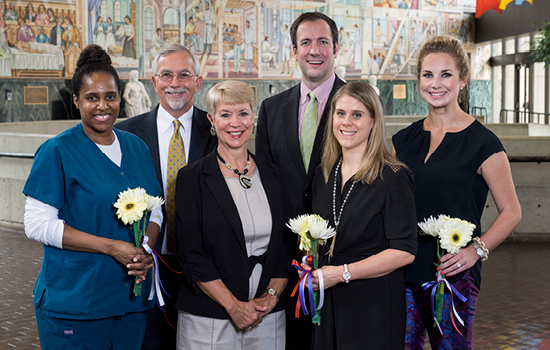 Left to right: Deatra Perkins, one of four 2015 winners of the Katie Ferraris Taylor Oncology Nursing Fund Award; Garry Ferraris; Ginny Ferraris; Keith Taylor; Award winners Heather Billings and Catherine Caprara. Not shown Carmen Hancock. Just nine months after her devastating diagnosis, Katie Ferraris Taylor lost her life to a rare form of leukemia. But in that short time, she cemented strong bonds with the oncology nurses who lovingly cared for her, laughed and cried with her, and celebrated her birthday and her wedding. In 2007, she died at age 29 on the same note that she lived her life, says her father Garry Ferraris. "Katie was always upbeat and especially grateful to her nurses. She kept her sense of humor and never lost her sense of grace. When we would be weak she would be strong. She maintained a positivity that was unbelievable under the circumstances." The recent law school graduate experienced firsthand the vital role that oncology nurses play in improving the quality of life of patients and their families, and she wanted to leave an enduring thank you. 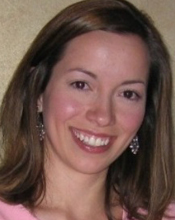 Her legacy is the Katie Ferraris Taylor Oncology Nursing Fund Award. Through the generosity of more than 200 donors, the endowment, now valued at some $142,000, has helped 30 nurses pay for continuing education. Recent recipients Deatra Perkins, a 20-year veteran of oncology nursing, and Catherine Caprara, a newly minted oncology nurse practitioner, share a passion for their work with cancer patients. Ferraris Taylor was a patient long before Caprara started her career on the oncology unit in 2012, but Caprara, who now works in bone marrow transplant, marvels at how "the Ferraris family keeps coming back to say thank you. Their gift has an effect not just on the scholarship recipients, but also on the countless patients we will serve. That's the beauty of philanthropy: generosity perpetuates itself." At Winship, acts of generosity are inspiring research, promoting prevention, and offering hope for healthier futures. 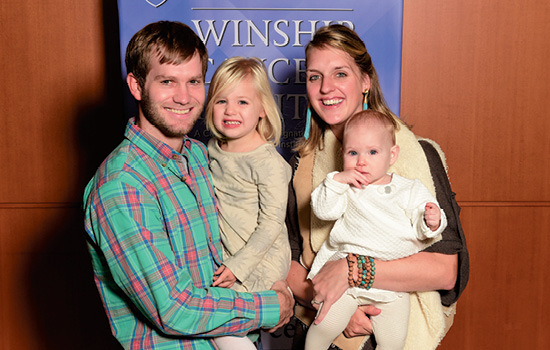 Consider Neil Gaines, who has raised $76,000 for Winship melanoma research. "Skin cancer wasn't anywhere on my radar when doctors removed an ugly mole on my back seven years ago," says Gaines, who was then 23 and a recent University of Georgia graduate with a new job and a new love. "I didn’t know what melanoma was or its severity." The most common cancer in 25- to 29-year-olds, melanoma is more likely to spread to other parts of the body than other skin cancers. Gaines has endured five surgeries and multiple treatments. In his fifth year of remission from stage IV melanoma, survival rate of 15 to 20%. Now married and a father, Gaines says that melanoma, if caught early, does not have to be deadly. He encourages others to look for signs of melanoma—a new spot on the skin; one changing size, shape, or color; or one that looks different—to wear sunscreen and a hat, and visit their physician or dermatologist annually. His daughters, he insists, "will never use a tanning bed." Committed to supporting melanoma research, Gaines and his wife Margaret will host the eighth annual MelaNoMo this fall. The barbecue fundraiser on the Chattahoochee River has grown from a few family members and friends in 2008 to more than 160 people last year. "From the beginning I've wanted to use my story for the better good," he says. "If I can help others understand the severity of this disease and the importance of education in melanoma, I can save lives." 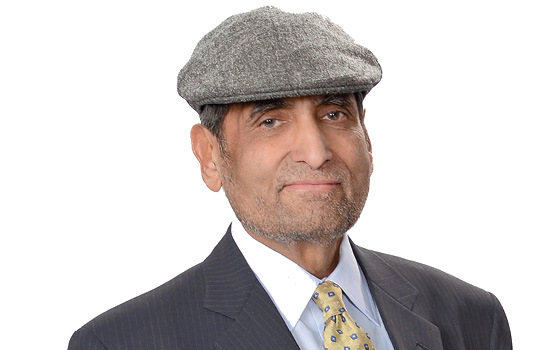 The family of the late Surinder Puri is supporting cancer research by endowing an annual lecture to advance knowledge about B-cell malignancies, which include a variety of blood cancers. The lectureship attracts leading researchers and clinicians to share their work with professionals and patients and foster opportunities for multi-institutional collaboration. Puri was a Renaissance man in the truest sense of the word, says Mridula Puri, his wife of almost 45 years. An engineer, he was as interested in poetry, art, music, and cooking as he was in building bridges. He was instrumental in shaping Atlanta's cityscape and infrastructure in the design and construction of MARTA. But in 2004, a drooping eyelid led to a diagnosis of a stage IV mantle cell lymphoma, a rare blood disease. Through advances in research and clinical care at Winship, he thrived for more than a decade, working full-time and living a full life with friends and family he adored, until his relapse in 2014, and end of life in January 2015. The inaugural Surinder K. Puri Memorial Lectureship on February 5, Puri's birthday, featured Ash A. Alizadeh, from Stanford School of Medicine, discussing "Personalized Cancer Detection and Monitoring Using Deep Sequencing of Circulating Tumor DNA." The Puris have a long history with Emory, says Mridula Puri, a former faculty member. "We have great appreciation for all the faculty and staff, and our mission is to disseminate cutting-edge research and treatment information to benefit as many patients as possible." For more information about how you can support the work of the Winship Cancer Institute, contact 404-778-5175 or visit our website.